Multiplatinum-certified Academy® Award-nominated and GRAMMY® Award-winning Toronto rapper, singer, songwriter, and producer BELLY unveils his new tape, Mumble Rap. The project represents an important statement for the artist. 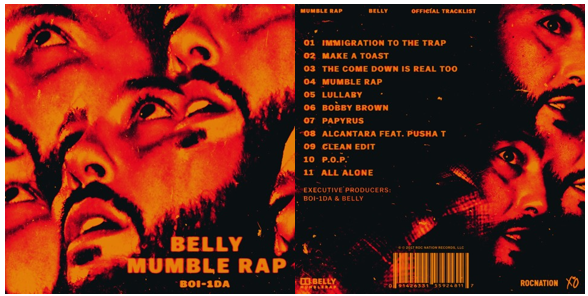 Executive produced by Boi-1da, BELLY, and Dannyboystyles, the 11-track collection which includes a guest feature from Pusha T harks back to the art of spitting, slyly name-checking modern “Mumble Rap” as it unseats the movement with classic charisma and rambunctious rhymes. A division of Universal Music Group, the world's leading music company, Republic Records is home to an all-star roster of multi-platinum, award-winning legends and superstar artists such as Ariana Grande, Aminé, Black Sabbath, DNCE, Florence + the Machine, Gotye, Hailee Steinfeld, James Blake, James Bay, John Mellencamp, Jordan Smith, Julia Michaels, Keith Richards, Kid Cudi, Liam Payne, Marian Hill, Of Monsters and Men, Post Malone, Seth MacFarlane, Stevie Wonder, and more. Founded by brothers and chief executives Monte and Avery Lipman, it is also comprised of innovative business ventures, including American Recordings (The Avett Brothers, Towkio), Boominati Worldwide (Metro Boomin), Brushfire (Jack Johnson), Casablanca Records (Giorgio Moroder, KUNGS, Tïesto), Cash Money (Drake, Lil Wayne, Nicki Minaj), Hollywood Records (Sofia Carson, Zendaya), Lava Records (Greta Van Fleet, Jessie J, Lorde), Monkeywrench (Pearl Jam), XO (The Weeknd), Roc Nation (Belly, Justine Skye, The Dream), Tuff Gong (Damian Marley), Victor Victor Records (D Savage, Ski Mask The Slump God), among others. Republic also maintains a long-standing strategic alliance with country powerhouse Big Machine Records (Taylor Swift), and Universal Music Latin Entertainment (Luis Fonsi, J Balvin). In addition, Republic has expanded to release high-profile soundtracks for Universal Pictures (Fifty Shades of Grey, SING), Fox TV (Lee Daniels' STAR), and NBC TV (The Voice), as well as other notable film and television franchises.